Starting with my favorite and most practical area of the room to upgrade- there are so many different ways to make your walls more interesting. Try an accent wall using paint or a decorative wallpaper, paint the bottom half of the walls, or you can add a border to the middle or top. After the walls are complete add a gallery wall of artwork and family portraits. I love black and white family photos and flea markets are great for sourcing small, yet unique pieces of art. Lets move over to the focal point and the most important piece in the room- the bed. Replace any flat pillows or outdated comforter sets. Buy a simple comforter and add an abundant amount of decorative pillows. Printed comforters are not always necessary, unless of course, you find a nice pattern. My experience browsing the bedroom section is never a good one; many sets tend to look cheap which is why I prefer to create my own color scheme with pillows. Give your guest options of soft and firm pillows for their comfort. Instead of replacing what you already have, try some “Do It Yourself” projects. 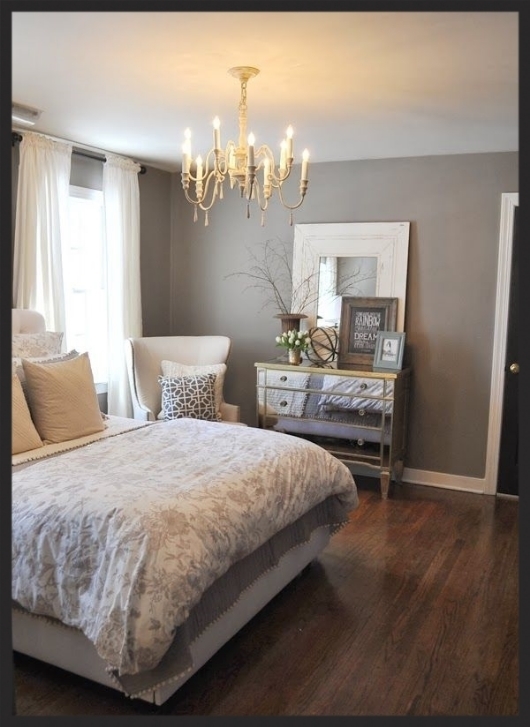 If your table lamps or dressers do not flow with the new room you have in mind, there are plenty of tips and tricks available on Pinterest and other sources. After painting the lamp stand and adding some fabric to the shades, you’ll forget what your old lamp looked like. As for the nightstands, they can also be painted and the knobs can be replaced. DIY projects make a room much more personal because not only did you get your hands a little dirty, but you created a customized piece that no one else has. Depending on how big the room is, you can add an ottoman at the foot of the bed, or a chair and side table in the corner of the room, keeping in mind to mix and match your patterns and textures. It is a good idea to get a trunk that acts as an ottoman as well as storage for towels, sheets, or clothes. If you choose to create a cozy corner, place a decorative pillow on the chair and stack some magazine with a paperweight on the side table to accessorize. Don’t be afraid to pick up your neighbors old chair they put on the side of the curb for trash or a beat up piece of furniture you stumble upon at the flea market. Upholstering is much easier than you think. After adding an area rug, some shelves to the walls, and a few nick knacks to fill in any empty spaces, your bedroom is complete! Do your research, compare prices, and have fun. In our final blog about affordable decorating, we will go over tips on how to create an affordable living room...coming soon! An accent wall that centers the room and emphasizes the focal point- the bed. Simple bed linen, a cozy corner, decorative pillows, and a dresser with acessories. The before of a very basic dresser. The after! It's amazing what a simple paint job and knob change can do. A simple lamp makeover. I'm sure most of use wouldn't even look twice at the original lamp but with a creative mind, there is beauty in everything. A trunk that sits at the foot of the bed and acts as an ottoman and storage. Affordable accessories to add to dresser tops and shelves.